Christ Church is on Francis Road, Leyton. A true urban church, it is almost one with the surrounding terraced housing. 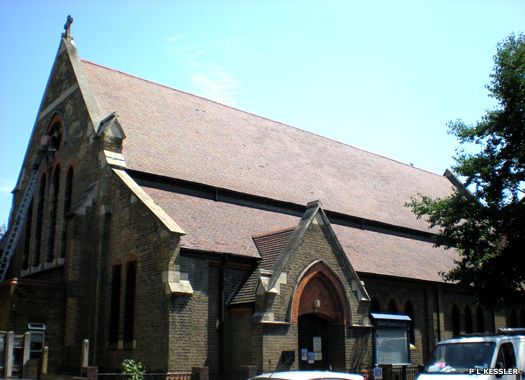 The church originated with the Phillibrook mission in Leytonstone, in connection with Leyton's St Mary's Church, and later with St Catherine's Church on Fairlop Road in Leytonstone. An iron room was built here in 1885, and was enlarged in 1887 and 1892. The permanent brick church, designed by Sir Arthur Blomfield & Sons, was opened in 1902, next to the mission. To the right of the main doors a foundation stone reads: 'This stone was laid by the Right Honourable Viscount Portman May 31st 1902'. However, funds were difficult to raise in this poor district and only the nave and south aisle were built, with a temporary east wall of iron built in the chancel arch. Christ Church gained its own parish in 1904. In 1959 the east wall (facing out towards the road) was permanently bricked and an east window inserted. 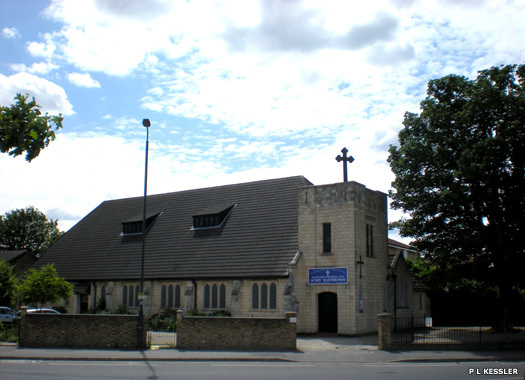 St Eleftherios Greek Orthodox Church is at 113 Ruckholt Road in Leyton. It originated in 1901 as an Anglican iron mission building to serve the westernmost parts of the parishes of Holy Trinity Church and St Catherine's Church. In 1914, the permanent Church of St Luke was built in grey terracotta. The north-west tower remained uncompleted. The church was badly damaged in the Second World War, but was subsequently restored, and was later passed onto the Greek church. Leyton Trinity Methodist Church lies on High Road Leyton at the corner with St Mary's Road. A smaller, older hall lies immediately behind the main building, on St Mary's Road, and is just visible here underneath the no entry sign. Although there was a Primitive Methodist church established in the early twentieth century on the corner of the High Road and Etchingham Road, this later folded, and no history for Trinity Church itself can be found, with the building appearing to be recent. The Redeemed Christian Church of God, Adonai Ambassadors Assembly meets inside the Legacy Business Centre on Ruckholt Road, next to Leyton Library, and is a branch of the same church which operates 'Redemption Parish' from a location further north in Leyton. The church was founded in Lagos in 1952 by Pa Akindayomi, a Nigerian who had become disillusioned with the Cherubim and Seraphim Church. The church exploded out into Europe from 1981. 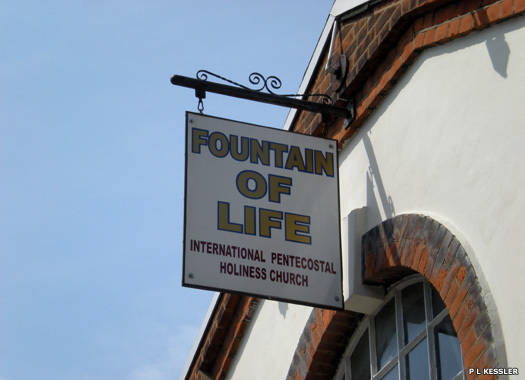 The Fountain of Life Church on Ashville Road is a branch of the International Pentecostal Holiness Church. 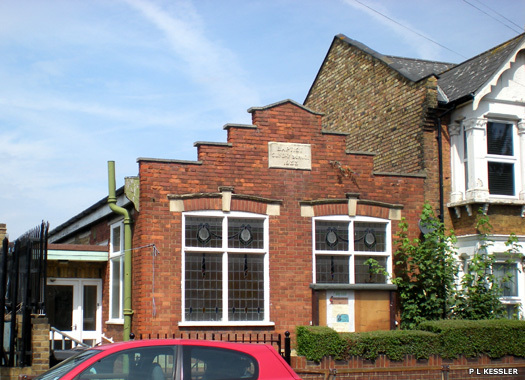 It began life as a mission for Fillebrook Baptist Church, Fairlop Road, Leytonstone, in 1888, known at first as the Grove Green mission, but later as the Ashville Baptist Mission. 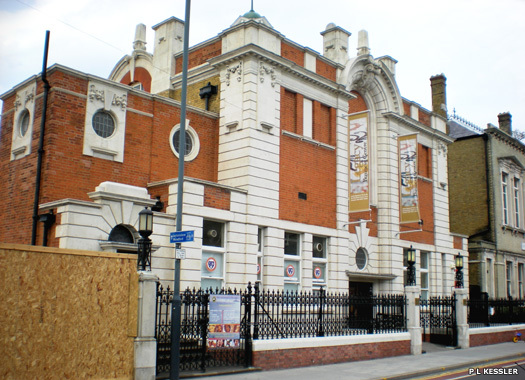 A hall was opened for it in 1892. 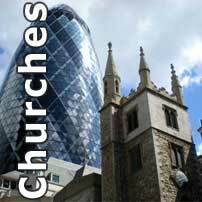 Church membership rose from 37 in 1878 to over 500 by 1902. In 1903 total Sunday attendances were 1,169, the second highest locally for all denominations. A new additional Ashville Hall was built in 1923. Membership was still over 500 in 1936. 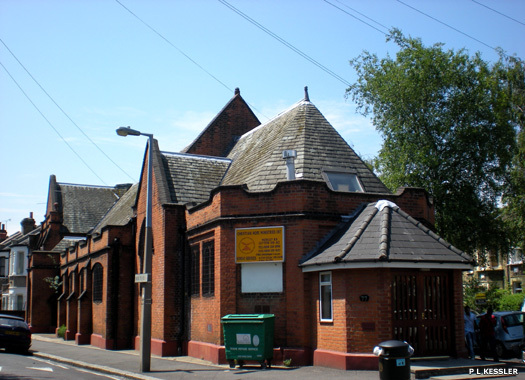 After the Second World War, though Fillebrook continued to be the largest Baptist church in Leyton, membership fell, from 468 in 1946 to 212 by 1966. The Ashville mission closed and the newer Ashville Hall was sold to the Brethren in 1947, and much more recently to the International Pentecostal Holiness Church. The old Ashville Hall was also sold by 1949 and was used as a factory by 1968. 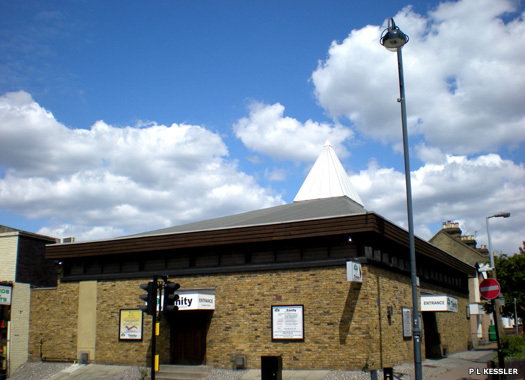 Christian Hope Ministries lies on Morley Road, midway between Christ Church Leyton and Elim Pentecostal Church. In 1901 a mission in connection with St Mary's was opened in Claude Road. In 1902 a small site was acquired in Morley Road and the mission continued in a tent there and in neighbouring cottages until 1905, when the permanent Church of St Edward was built here. It gained its own parish 1933, but the church was closed in 1968 and the building sold on. 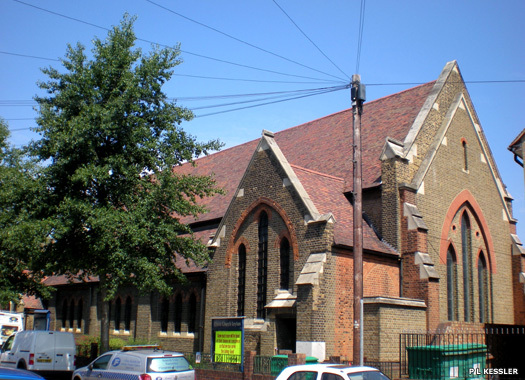 Hainault Road Baptist Church, towards the north of Leyton, began life in 1880 when Strict Baptists began to meet for worship in Park Terrace, Church Road in Leyton. 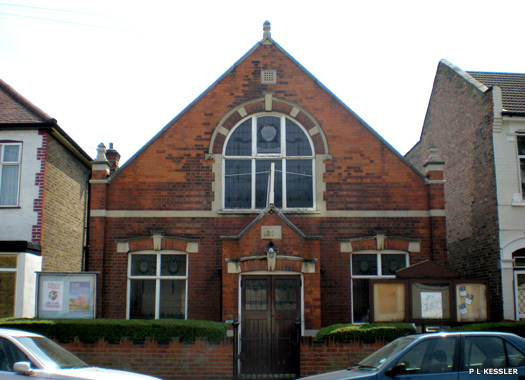 They moved to Goldsmith Road (off Church Road) in 1882, and from 1894 services were held in Wilmot Road, in a chapel bought from the Primitive Methodists. In 1895 an organised church was formed with H E Bond as pastor, but after he left in 1896 it was without a pastor for over twenty years. In 1903 total Sunday attendances of fifty-three were among the lowest in the district. A full-time pastor was again appointed in 1920. 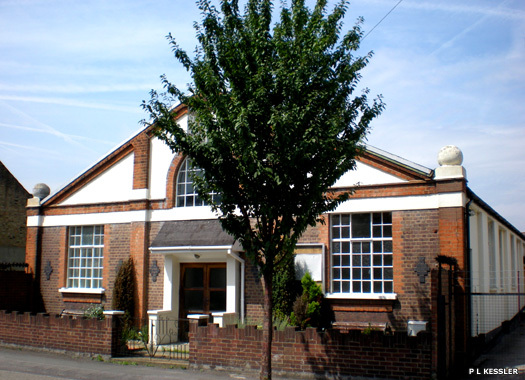 In 1926, when church membership was thirty-three, the Hainault Road church building was constructed and opened. The Sunday School building pictured here was opened on the other side of the road in 1933, and is still in use. By 1946 membership of the church was 148. In 1966 it was 75, but it continues in use despite the low figures.